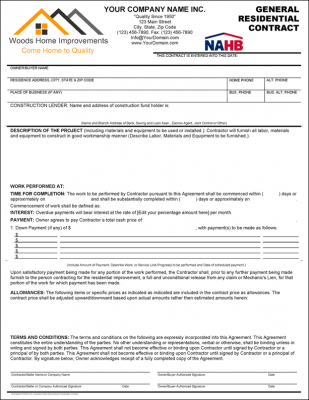 Help boost customer confidence that the work or installation has been done properly by providing your client with a remodeling industry, all purpose, labor workmanship or parts warranty certificate after job completion. This has been proven to help gain traction with customer trust and word of mouth recommendations in the long run. Similar to Remodeling Certificate #812 but with slightly different layout and vertical orientation. You may also opt to have one or many different types of certificates to comply with particular jobs or projects. 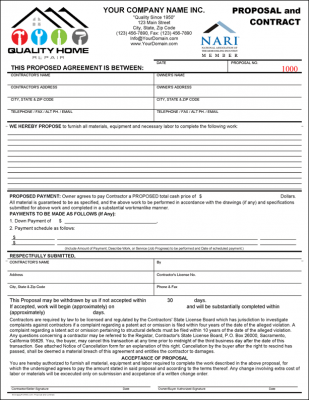 It may be a satisfaction guarantee, a warranty certificate on equipment or parts, a workmanship guarantee, an "x-Year(s)" parts warranty or quality pledge, an "x-Year(s) on parts such as a fixture or on kitchen cabinets, sink installation, a lemon guarantee, the possibilities are many —and also makes a good starting point towards selling a maintenance agreement. Certificates may be prepared in the office, or in field write-ups; print only as needed; Easy to personalize using Microsoft Word or free Adobe Reader, both types are bundled together. 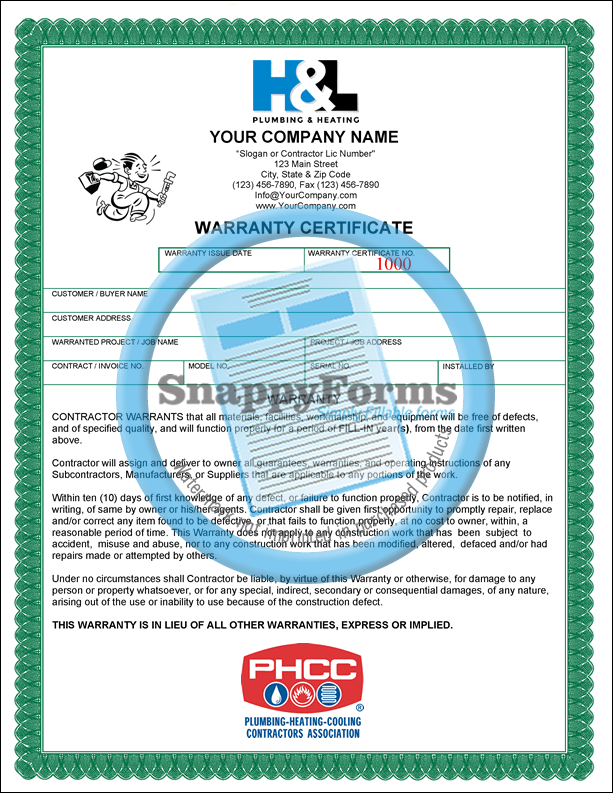 The certificate can be easily personalized with your own information and use as a fillable Word document or PDF form/certificate. All text is fully editable so you may edit the certificate fields labels to meet your needs, i.g. change "Customer" field, to "Client", etc. All certificate text is fully editable and may also be translated to other language(s). 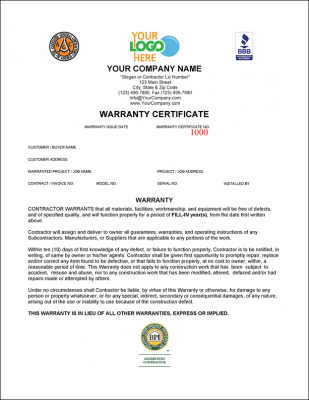 Tip for Certificates: You could require a routine maintenance agreement as a term of the warranty; certificates presented with a job/project proposal will also provide the customer with assurance and possibility of calling you for the job; usage as a coupon or voucher? 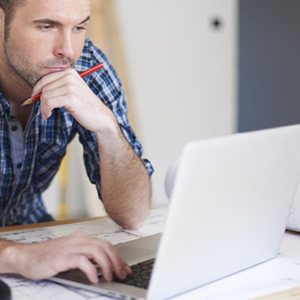 the possibilities are endless to help increase your confidence with your customers. About: Personalize the certificate to meet your own business needs using the Microsoft Word version or the interactive PDF certificate for use with free Adobe Reader. 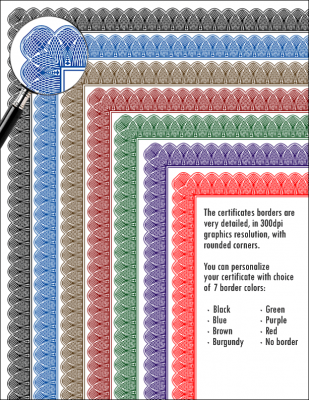 The PDF certificate provides much flexibility in coloring the content to meet your needs, choose from 7 border colors, choose from 7 certificate ruling colors to match the border, change the certificate's body text to choice of 7 colors, change the certificate field labels to any of 7 colors, also, you have choice of 7 colors for your company name, 7 colors for your company information and 7 colors for the certificate title. In addition add your own logo and other remodeling manufacturing or association logos, and use other type of images; the Word form, is done in a word processor so so you have full range of editing features. This certificates comes bundled with both, the Word document and the PDF certificate for use with free Adobe Reader, why both? It's about giving you, the customer choices to see which will work best for you, in your own business environment. Both types allow you to fully edit/add your company information, import your business logo and other promotional logo/images (i.e. BBB and other trade certification logos/images), change certificate field titles, terms, border colors, etc. 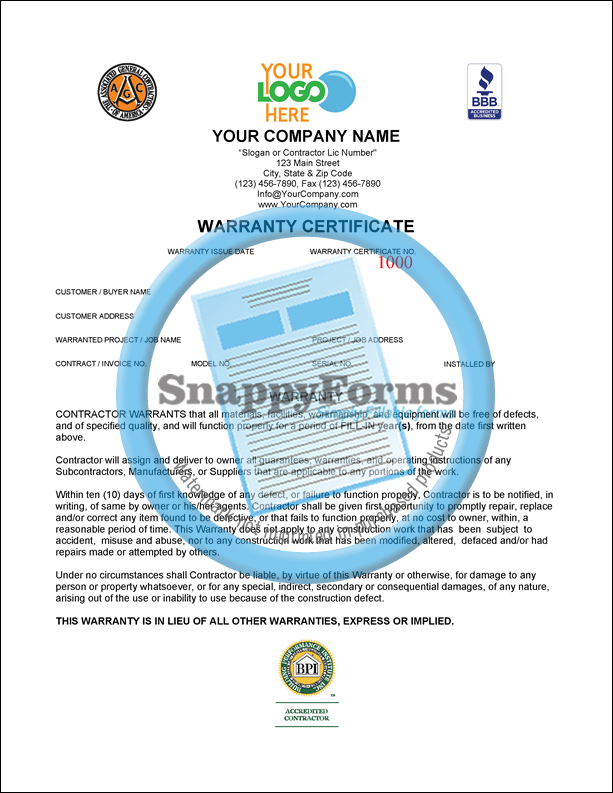 -certificates are fully editable and do not contain any type of protection or locked in any way so that you are free to edit the certificate to meet your exact business needs. 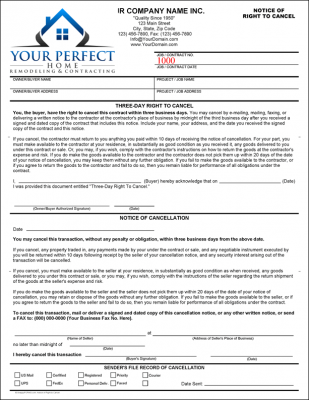 When you are finished customizing your certificate, fill out your customized certificate using your desktop/laptop computer and print to you desktop printer -or email- for a professional looking finished document that is sure to impress your potential customer (blank certificates may also be printed to fill out by hand or to deliver to your offset printer as camera-ready artwork for quantity/offset printing). 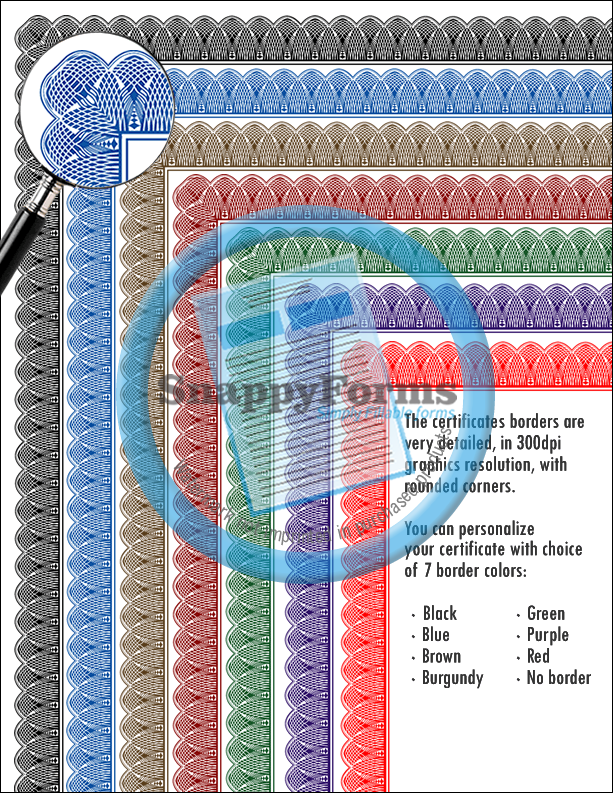 Ruling & Border Colors: 7 certificate ruling colors, 7 border colors OR print without border or ruling. Printing: Certificate may be printed to any desktop, laser or inkjet printer, in color or black and white. 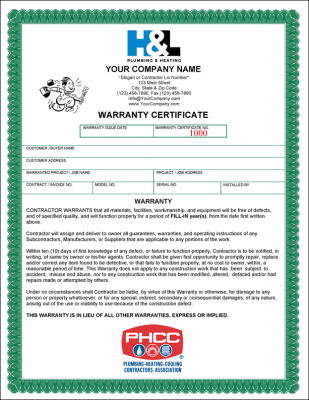 Print only the certificates that you need to avoid waste. For large print volume, deliver to your local office supply store, local print shop or copy center and save on typesetting or graphic design fees. Format: This certificates comes bundled with Microsoft Word documents and an Interactive PDF file for use with free Adobe Reader or Adobe Acrobat.